One of the things I most love about my involvement with Yarndale* is the creative bits and bobs that I am responsible for. The Yarndale team is made up of five people and each of us have different jobs to do throughout the course of the year. I for one am mighty glad that I don't have to deal with complicated things like Health and Safety, or Accounts as I am pretty certain that I would be an epic fail at those things. But Yarny Stuff, yup that's my thing, and I really enjoy the creative challenges. Right now we are in full swing preparing for the fourth Yarndale* festival which takes place on 24th and 25th September (six weeks away - yikes!). I've been working hard on several creative projects during the past few months and thought you might like a little peek? 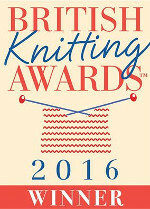 Each year Yarndale* produces an A5 colour brochure which is given to every visitor as part of their ticket entry. A brochure is an essential thing to have at a large festival - it contains a floor plan, lots of practical information about the event, and a full list of the 180+ exhibitors who come to demonstrate, share and sell their beautiful woolly goods. The brochure also contains some short articles about the various creative displays, and an interview with the previous year's "Best in Show" winner. As well as all that practical stuff though, I think it's rather lovely for a brochure to go one step further and offer just a little bit more than the essentials, don't you? So amongst all the blurb contained in the 40+ pages you will find some knitting and crochet patterns included. Just because we can! We usually aim to have at least three patterns each year if we can manage - the Tweetie Bird Brooch shown in the picture above was my contribution for the first brochure. It's not always easy to think of small projects that can be written up as short, easy to follow patterns ( I am Queen of the Long Winded Approach and the word "concise" doesn't often figure in my pattern writing). But every year I do my best to dream up a cute little decorative crochet something and apply myself to writing up a proper grown up pattern for it. For this year's brochure, I designed a Little Owl...................awwwwwww!!!! I find designing anything in three dimensions an incredible challenge, verging on the impossible for my 2-D loving brain. I can visualise flat patterns and images pretty well, but three dimensional shapes and objects (even easy ones) don't come at all easy to me. I rather love how my little owl turned out, and even surprised myself with how satisfying I found the methodical counting that crocheting in a continuous spiral requires. I made quite a number of different birds in various shapes and sizes and with varying degrees of stripyness before I settled on the simplicity of this one. I used some oddments of Drops Karisma yarn for my owls - we've been using this yarn for a few other Yarndale projects recently (it's 100% wool DK) and I love the richness of the colours which crochet (and photograph) beautifully. So if you are visiting Yarndale* in September I hope you enjoy the patterns included in the brochure and feel inspired to dig in your stash and whip up a bird or two. I think I'll be able to share my owl pattern here on my blog later in the year too - they make really lovely little hand made gifts and I can even picture some owls sitting in the branches of my Christmas tree. Hmmmm.....I can't believe I just had a festive thought in August and typed the C word. Cripes. Anyhooooo.....back to summer thoughts, and baaaaaaaaaaaaaaaaaaaa!!!!!!!!!!!!!!!!!!!!!!!!!!! Woolly Sheep have been occupying my mind for a good many months now, in fact they completely took over my creative energies throughout much of May and June. As many of you will know, I am involved with dreaming up and organising a large scale Creative Community project to be displayed at Yarndale* each year. It's a huge undertaking, but something I absolutely love to do - it's such a beautiful way to celebrate the vibrant and amazing yarn community that I've become a part of through writing my blog and in my real life too. This year we decided to have a go at gathering together a flock of little Woolly Sheep - we thought that as Yarndale* takes place in a rural auction mart, it would be a fun reminder that just days before the festival, the place is indeed full to the brim with real live sheep! The idea was inspired by a little knitted sheep designed by Frankie Brown that I came across on Ravelry one day back in the Spring. Frankie very kindly gave me permission to take her original knitted sheep and create a crochet version. Ho ho, it's so easy to write the words "create a crochet version"!!!!! Honestly, I can't tell you how difficult it was for me to actually come up with a workable crochet sheep pattern, it took weeks and weeks and many, many hissy fits. First up I had to actually knit the sheep from Frankie's pattern to see how it was constructed and what size it would be. I had to knit moss stitch and everything! But the pattern was very well written and I was immediately smitten by the cute little woolly sheep I managed to knit, complete with it's little knitted jumper made from left over sock yarn. .....ahhhh, that's better! You can see from me holding my sheep that they are quite small, measuring approximately 8cm tall. I used oddments of DK yarn and a 3.5mm hook to make mine, and (once the agony of the pattern writing is over) they are pretty quick and easy to whip up. Every so slightly fiddly perhaps (there is some stitching up to do), but they are lovely little things to make. You know I mentioned earlier that I find 3D things hard to get my head around? Yeah....creating a pattern for this little woolly sheep really tried my patience I have to say. The head is made in amigurumi style (working a continuous spiral in double crochet) and took many failures before I got the shape just right. Too big, too small, too fat, too thin, too egg-shaped, too dog-like.....argghhhhhh!!!! The body and the jumper are both made as flat pieces worked in rows of double crochet. In theory I should have been able to nail this part of the design pretty easily, but in reality it's not as simple as you might think to turn a flat thing into a sheepy thing. I had a lot of issues with the proportions, and so many of my early attempts looked like dogs and ended up flying through the air in the direction of the bin. However, I am not one to give up easily and after a mini herd of dog-like creatures were made and rejected, I eventually got me a sheep. Pheww. The other thing I found interesting was how the face could change so dramatically by altering the stitches by mere micro millimetres. Placed too high up, and the dog was back (sheep features need to be right low down, just saying). Stitch the eyes too close together and the cute look is replaced by something rather shifty. Or possibly deranged. But as with everything else, all it needed was patience and practice, and by the time I arrived at sheep number 437 I really think I got the expression just right. So after several months of rather tense trial and error, I managed to write the pattern and make a neat picture-heavy tutorial, oh deep joy! As always, the pattern is right here on my blog for you to use and enjoy for free and I would be thrilled if you felt like whipping yourself up a sheepette or two. Keep them, gift them, sell them for charity, have fun with making them just the way you want them. As I said a bit ago, before I began rambling about the chew of making a sheep look like a sheep and not like a deranged dog, there was mention of a Creative Community project for Yarndale*, which involves gathering together a whole flock of woolly sheep. I wrote all about the project over on the Yarndale blog if you want to pop over and have a little read. You can find out about how the sheep will be involved with fund raising for charity, and all the details for making and posting a woolly sheep to join the flock. ....each one has such character, and the Yarndale* team is very grateful to everyone who has already contributed with so much hooky love and creative flair. I have made a start photographing each individual sheep so that I can create a visual gallery over on Pinterest. That way I can share all the beautiful and creative details (there are some real beauties!) and you can find out where each sheep has travelled from. I'll let you know as soon as that's up and running. There is still another four weeks until we close the gate and round up the final flock, so if you fancy joining in, go grab your hook and have some sheep-filled fun! Oh my goodness! The sheep are so adorable! I can see how fun they are with their expressions and overall cuteness. I am thinking of trying to make one myself! Good Luck at Yarndale 2016! Lucy I love the lambs and the owls and your bird brooch - you are so inspirational. Thanks for coming back - you are a good writer and I always look forward to reading your blog. Hope you have a successful week at Yarndale . If international shipping were cheaper, you would have a sheep from Texas. Alas, I am poor in money, but rich in yarn. I foresee sheep and owls for Christmas gifts this year. I quite like the sheep without their jackets. Or perhaps I could make a jacket which looked like normal fleece . . . These owls and sheep are ridiculously adorable! Ahhhhhh, it's been so lovely to pop by and catch up with life in Attic24! Seriously, I don't know how you manage to fit everything in Lucy. This year for me, has been one where I just cannot get going, like my feet are stuck fast in concrete. Weird, but you always inspire me, and lift me with your love of colour! So thank you! Have a beautiful rest of a summer hols! These sheep are sooooo adorable! I cannot wait to see all the pics of them together at Yarndale! Wish I could come but the travel distance is a bit to long from Germany. Just love the sheep ! Well done and thanks for sharing the pattern.Really hope Yarndale is a big success you put so much into it. What will happen to the little sheep ? Are they sold for charity ? Can you buy them online ? Great job, Lucy! You are so talented!! I'm definitely giving both of them a go. Know that I will never be able to attend Yarndale so it makes me enjoy your pictures much, much more. Thanks for sharing. There are lots of similar owl patterns on Ravelry etc if you search so no need to wait for Lucy's pattern to become available if you want to make one. They are not very complicated. Those sheep are soooo cute! I am a beginning crocheter- have been for years! Not sure I could ever manage one but I want like 500 of them! What a great flock of sheepies. Love the colours. I love crochet and you have lots of inspiration here in your lovely blog. Beautiful colorful photos. I just love those sheep. They have such expressive faces! sqeeeee.. the lambies! omg!!! so dear! One day I am giving myself a trip to my beloved Dales again just in time for Yarndale... Until then, please keep posting lots of pictures so I don't get too homesick!